CELEBRATING 31 ART INSPIRED YEARS! PLYMOUTH , MICHIGAN – Celebrating 31 years of art, cuisine, and entertainment, Plymouth Art in the Park returns on July 9, 10 and 11. Turning the streets of downtown Plymouth into a whimsical color palette, the event, which is directed and managed by mother and daughter, Dianne Quinn and Raychel Rork, offers the best local, American, and International artists. Over 375 artists (80 being new exhibitors) from around the United States and throughout the world will be featuring thousands of original pieces of art including paintings, sculpture, ceramics, jewelry, fiber, fine glass, woodwork, mixed media, photography, and folk art. Children artists ranging in age from 7 to 17 will also have their art on display for purchase. From practical to surreal, witty to the extravagant, there is bound to be something for everyone. My Adventure Theater , an interactive, family friendly theater experience for the entire family; no experience necessary. Held in Kellogg Park, characters are chosen from the audience; costumed on the spot and narrated through action-filled, laugh-packed adventures complete with songs and dancing. Live productions of Pirate Island and Nottingham Forest will be featured. Guests of Art in the Park will also enjoy live entertainment and excellent food all weekend. Visitors coming to Art in the Park are encouraged to park at the ACH Plant (formerly Visteon Plant) located at 14425 Sheldon Road, just off of M-14 in Plymouth and take the free round trip shuttle service. The shuttle will run continuously all weekend. The drop off point will be Plymouth City Hall conveniently located in the heart of the art fair. Indian Motorcycle Co. was born as the Hendee Manufacturing Company by George M. Hendee and Carl Oscar Hedstrom (pictured above with the first prototype of Indian). It was the first American motorcycle company and the most popular in the world by the time the New York Times wrote the paragraph above. Both men were former bicycle racers who got together to build a 1.74 bhp, single cylinder engine in Hendee’s home town of Springfield, MA. The bike was a huge success and and sales increased drastically during the next 10 years. Indian Motorcycle was very innovative. In 1901 the prototype and two production models we successfully designed, built and tested. Work began in previous years. In 1902 the first Indian motorcycles, featuring innovative belt-drives and streamline styling were sold to the public. 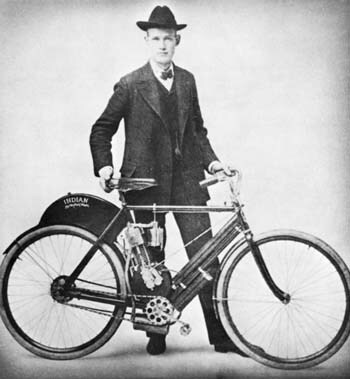 In 1903 Indian co-founder and chief engineer Oscar Hedstrom set a world motorcycle speed record by riding 56 mph. In 1904, the diamond framed Indian Single was made available in deep red. This color would become Indian’s trademark. By this time production was up to over 500 bikes per year and would rise to 32,000 in 1913. It’s best year ever. In 1906 Indian built its first V-Twin engine. 101 years later the V-Twin is the most popular engine style in the world. The following year Indian made a strong showing in racing and record breaking. In 1914 Erwin “Cannonball” Baker, who set many long-distance record, rode an Indian across American from San Diego to New York in a record 11 days, 12 hours and 10 minutes. Baker’s engine of choice in the following years was the Powerplus, a side-valve V-Twin which was introduced in 1916. It was a 1000cc, 42 degree V-Twin which was more powerful and quieter than previous designs, giving it a top speed of 60 mph. The design was highly successful both as a roadster and as a racing bike. It remained in production until 1924. Oscar Hedstrom left Indian in 1913 over a disagreement with the Board of Directors regarding dubious practices to inflate the company’s stock values. George Hendee resigned in 1916.